Global rehabilitation robotics firm Hocoma will work with Severance Rehabilitation Hospital to create a Hocoma Reference and Training Center at the Severance, the hospital said Wednesday. The reference and training center will be the first of its kind in the Asia-Pacific region and will serve as a central location for those interested in learning about rehabilitation robotics therapy in the Asia-Pacific region, Severance said. Related dignitaries commemorate the dedication of Hocoma Reference and Training Center at Severance Rehabilitative Hospital in Seoul Monday. They are, from left, Eric Ong, Hocoma’s business development manager, Patrick Bruno, global vice president of sales rehabilitation solutions, Shin Ji-cheol, Severance Rehabilitation Hospital director, and Kim Doug-young, the hospital’s medical director. "Severance Rehabilitation Hospital, which leads rehabilitation medicine in Korea, and Hocoma, one of the world's leading rehabilitation robotics company, will work together to introduce robot rehabilitation treatment not only for domestic patients but also patients in the Asia-Pacific region," said Shin Ji-cheol, head of Severance's rehabilitative hospital. 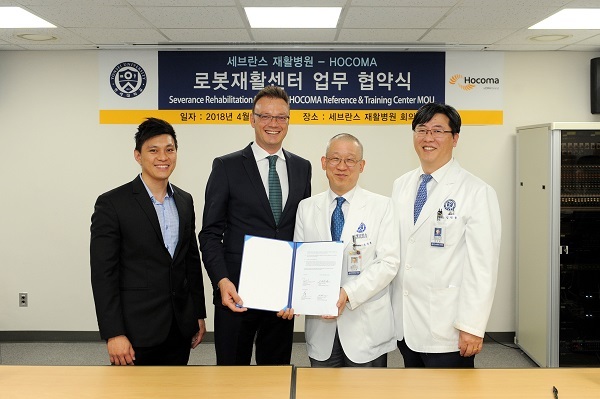 Severance Rehabilitative Hospital will act as Hocoma's clinical partner, with the two working towards jointly hosting related workshops, clinical studies, and other research and development activities in the field of innovative robotic rehabilitation, it said.